All Web addresses mentioned were functional as of 7-17-15. From the Cumberland Gap to the Atlantic Ocean, this is Virginia Water Radio for the week of July 20, 2015. Unless July 20 is your birthday, you’ll probably agree that date’s most historic event happened in 1969, on a desolate, far-away place strongly connected to water on earth. Let’s listen back for about 35 seconds to parts of that history. SOUNDS – ~ 33 sec. Those were NASA recordings of Apollo 11’s lift-off on July 16, 1969; the July 20th lunar-module landing on the moon; and astronaut Neil Armstrong’s famous words just before setting foot on the moon. Watched live on television by an estimated 530 million people, Apollo 11’s moon landing was a milestone in space exploration, which in the 50 years since has achieved spacecraft landings on Mars and fly-bys as far away as Pluto, just last week. One of the main objectives of exploring the moon and beyond has been the search for evidence of water, particularly possible signs of liquid surface water on Mars and other cold outer planets and satellites where water ice has been found. But every day we see the evidence of the moon’s effect on Earth’s water. In 1687, Issac Newton explained scientifically how daily ocean tides result largely from the gravitational pull of the moon and sun, with the moon exerting the strongest influence. The moon’s pull also helps stabilize the orientation of the earth’s axis, a major factor in determining climate and seasonal changes. The moon’s gravitational effects play a role in two of the 21st Century’s big challenges—sustainable energy, and the impacts of a changing climate. In some places, the range and speed of daily tides provide enough renewable energy that commercial-scale electricity generation can be feasible. Meanwhile, predicted higher tides resulting from climate-related sea-level rises present a technological and political challenge to many coastal communities, not least in Virginia’s Tidewater and Eastern Shore areas. Just like reaching the moon, those and other current challenges tax our will, wallets, and imagination. So let’s go out with words President Kennedy used in 1961 to capture the United States’ imagination for reaching a goal about 240,000 miles away. SOUND – ~25 sec – Excerpt of NASA audio of President John F. Kennedy, May 25, 1961, speech to Congress. The Apollo 11 sounds and the May 25, 1961 recording of President John Kennedy’s speech to Congress were taken from the National Aeronautic and Space Agency (NASA), online at http://www.nasa.gov/connect/sounds/index.html. The audio notes that spacecraft have landed on Mars and, of course, Earth’s Moon. The audio failed to mention that, as of 2015, spacecraft have also landed successfully (returning useful data) on Venus and Titan, one of Saturn’s moons. NASA radar image of the north pole of the Moon, part of a March 2, 2010, NASA announcement of finding more than 40 craters in the area (green circles) that contain water ice, according to the characteristics of the radar images. Available online at http://www.nasa.gov/mission_pages/Mini-RF/multimedia/feature_ice_like_deposits.html. Bernd Brunner, Moon: A Brief History, Yale University Press, New Haven, Conn., 2010. Deborah Byrd, “Tides, and the pull of the moon and sun,” June 8, 2015, online at http://earthsky.org/earth/tides-and-the-pull-of-the-moon-and-sun. Paul J. Henney, “How Earth and the Moon Interact,” undated, Astronomy Today, online at http://www.astronomytoday.com/astronomy/earthmoon.html. David Levitan, “First Tidal Power in U.S. Starts Flowing to the Grid,” 9/18/12, IEEE Spectrum, online at http://spectrum.ieee.org/energywise/green-tech/geothermal-and-tidal/first-tidal-power-starts-flowing-to-the-grid. 1) Main Web site at http://www.nasa.gov/. 2) “Earth’s Moon,” online at http://moon.nasa.gov/home.cfm; see particularly the “About the Moon” and “Missions” sections. 3) Main Web site for the Apollo 11 mission at http://www.nasa.gov/mission_pages/apollo/missions/apollo11.html. before a Joint Session of Congress,” online at http://history.nasa.gov/moondec.html. 5) “New Images Suggest Present-Day Sources of Liquid Water on Mars, 6/22/00, online at http://nssdc.gsfc.nasa.gov/planetary/news/mars_water_pr_20000622.html. 6) Mars Reconnaissance Orbiter Web site, http://nssdc.gsfc.nasa.gov/nmc/spacecraftDisplay.do?id=2005-029A. 7) NASA Television, “Our Solar System and Beyond: NASA’s Search for Water and Habitable Planets,” 4/7/15, online at http://www.nasa.gov/press/2015/april/our-solar-system-and-beyond-nasa-s-search-for-water-and-habitable-planets. 8) Jet Propulsion Laboratory, “NASA-Funded Scientists Detect Water on Moon's Surface that Hints at Water Below,” 8/28/13, online at http://www.jpl.nasa.gov/news/news.php?feature=3887. 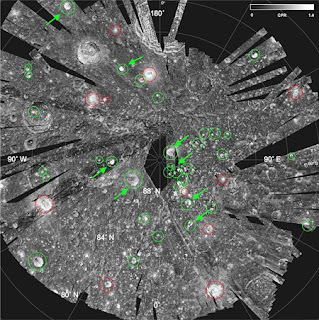 9) “NASA Radar Finds Ice Deposits at Moon's North Pole,” 3/2/10, online at http://www.nasa.gov/mission_pages/Mini-RF/multimedia/feature_ice_like_deposits.html. 10) Solar System Exploration Web site, http://solarsystem.nasa.gov/. National Oceanic and Atmospheric Administration (NOAA), “Tides and Currents,” online at http://tidesandcurrents.noaa.gov/. NOAA/National Ocean Service, “Where is the Highest Tide?” online at http://oceanservice.noaa.gov/facts/highesttide.html; and “Tides and Water Levels,” online at http://oceanservice.noaa.gov/education/tutorial_tides/welcome.html. Nineplanets.org, “Planetary Science Spacecraft,” online at http://nineplanets.org/spacecraft.html. PBS NewsHour, “Pluto, Underdog of the Solar System, Finally Gets Its Day,” July 15, 2015 (8 min./51 sec. video), online at http://www.pbs.org/newshour/bb/pluto-underdog-solar-system-finally-gets-day/. A report on NASA’s New Horizons spacecraft’s fly-by of Pluto, the latest (as of July 2015) chapter in U.S. space exploration. The report includes a brief history of the discovery and previous investigations of Pluto. U.S. Department of Energy, “Tidal Energy Basics,” August 13, 2013, online at http://energy.gov/eere/energybasics/articles/tidal-energy-basics. U.S. Department of Energy/Office of Energy Efficiency and Renewable Energy, “Marine and Hydrokinetic Resource Characterization and Assessment,” online at http://energy.gov/eere/water/marine-and-hydrokinetic-resource-assessment-and-characterization. This site, part of DOE’s Water Power Program, covers energy potential and use from tides, ocean and river currents, waves, and thermal gradients in the ocean. Virginia Department of Transportation, “While Interest in Tidal Power Surges Ahead, U.S. Lags Behind Europe in Experimentation and Implementation,” prepared by Ken Winter, April 2009, online (PDF; 47 pages) at http://vtrc.virginiadot.org/rsb/rsb24.pdf. This is a bibliography of reports on the use of tidal power worldwide. Virginia Institute of Marine Science, “VIMS calls for flexible, multi-step approach to deal with flood risk,” 1/10/13, online at http://www.vims.edu/newsandevents/topstories/flooding_study.php. This is the first Virginia Water Radio episode on a topic related to space. For links to other episodes grouped by category, please see the Index link above (http://www.virginiawaterradio.org/p/index.html). 3.8 – patterns and cycles in nature (including phases of the moon and tides). 4.7 – organization of the solar system. 4.8 – relationships among Earth, the moon, and the sun. 3.11 – sources of energy. 6.2 – energy sources, transformations, and uses. PS.6 – energy forms, transfer, and transformations. ES.7 – geologic processes, including plate tectonics. ES.10 – ocean processes, interactions, and policies.